Today Chuck and I fixed a flooded culvert on the Chickadee and then drove up the road to turn around. 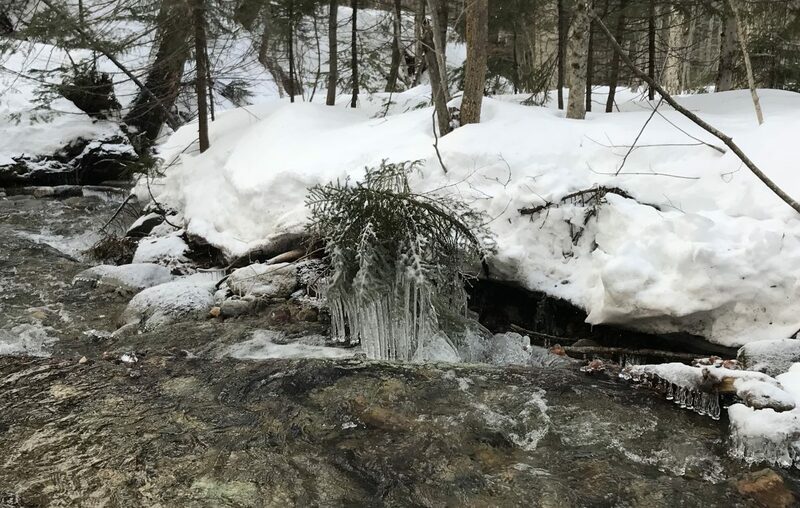 Driving over Jones Brook I noticed a tree full of icicles. It had formed from high water to low water, and dropping temperatures. I asked Chuck to stop so I could get a photo. Hoped out of the truck with one mitten. Figured out I would need both mittens to get back up the hill out of the brook. Right about then is when I should have realized this was a questionable idea. Up over the snow bank, and down into the brook. Top of the thigh deep snow. Sliding on my bottom to get down the hill. Sat and took the photos. Above, pretty cool, right. After sitting in the snow, I was stuck. It was a struggle to get up. And then the climbing back up started. I was laughing, Chuck was worried. He couldn’t really help me and imagined himself having to call the rescue department to pull me up the hill. I struggled and crawled. I sunk in, my boots were full of snow. I finally got myself close enough to the top of the bank Chuck could hand me down a shovel and pull me part way up. I made it!! And I decided when I can’t just jump over the bank and know I can get myself back out I am will be in a different stage of my life. So for as long as I can I am going over the bank with little thought to how I am getting back out. Yes, I want to subscribe to Skiing News by email. Season summary: November 1, 2018 – April 11, 2019. Days officially open: 106. Unofficially open/season pass only: 131. Total season snow fall: 136.3 inches. We never closed for lack of snow, only on warm or rainy days for snow preservation! Subscribe and join 141 other subscribers to receive emails that keep you informed. After you subscribe, don’t forget to check for your confirmation email in your inbox and junk mail. Fill out our "I like to ski Wild Wings because..." submission form to add your two cents! See the whole list on a page here. Thank you, Chuck, Tracy and Ian, for being the best groomers in the area. You work every day to make it possible to ski! We love the trails at Wild Wings…every ski level has beautiful trails through the woods, and it never feels crowded. © 2019 Wild Wings Ski & Yoga.